By now, many of you may have heard the words ‘10 Fest’ thrown around in the HKRS Community. Well, we wanted to take some time to tell you a little bit about what this means to us and why we are organizing some of these commemorative events in 2019. This all started back in 2009 with one small event at a freshly established high school in the West Chester School District of Pennsylvania. Jeff Long was green behind the ears as a new business owner. He was grinding for opportunities at every turn, trying to make a name for his company in the sports marketing world. Amongst the chaos of a fledgling business, he still wanted to find a way to build something in his local community: an even built around his love for running and physical activity that would bring joy and appreciation for the outdoors to the kids of West Chester. From all of this, Healthy Kids Running Series was born. A small Series in one town, trying to impact young lives in the community in a positive way. Fast forward 10 years, and we are preparing to start our 19th season with over 250 towns nationwide. Healthy Kids Running Series has turned into a movement and a mantra for many people throughout our community. Despite the growth, you might not even know that we are a national company. We have a modest office in a Philadelphia suburb, using the backyard spring house of a refurbished mill as our place of business. The number of full-time employees can still be counted on one hand. HKRS holds on to that small business, family feel because it is on that foundation that the mission was built. With our Anniversary, we have brought a new look to HKRS. We like to fondly say, “New Year, New Us’ around the office. We also wanted to find a way to celebrate the growth of our community over the past decade. The celebration is not just about us, but all 100,000+ participants that we want to share it with, not to mention the rest of their families. This is where the idea for Regional HKRS Festivals arose. 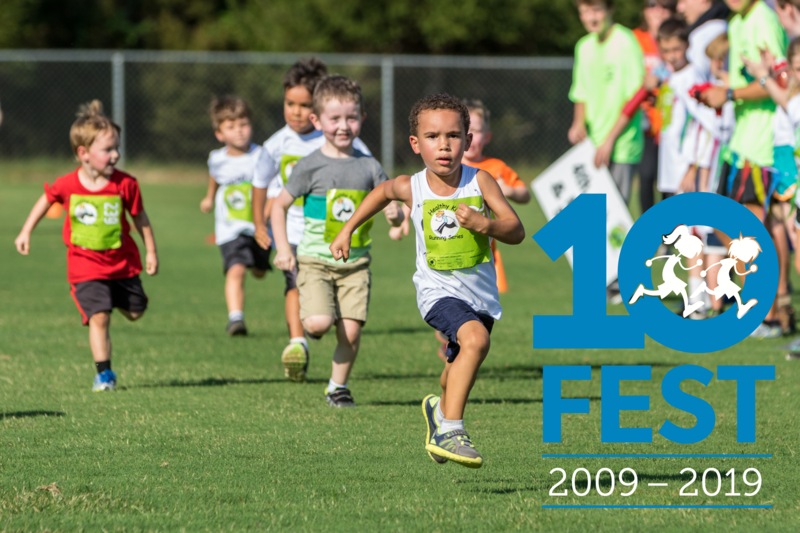 Beginning on Sunday, March 10th, we will kick off these ’10 Fest’ Events with at Blue Jacket Park in Orlando, FL, beginning at 1 p.m. The structure of the races will look a lot like the normal HKRS Sunday to which our families are accustomed. But at these events, kids from all over the surrounding areas and states will be attending, giving both past and new participants a chance to not only race against, but also befriend many other children from the HKRS Community, all in the name of getting healthy! Not only that, the excitement of 10 Fest Orlando will be bolstered by a slew of activities and fun to accompany the racing. Blue Jacket Park will be adorned in HKRS colors and lined with food trucks for families to enjoy. You will find a DJ blasting some of your favorite tunes with a host of entertainers at your disposal, including face painting, a photo booth, character artists, moon bounces, and balloon artists! It is going to be a true party, in full HKRS fashion. The Orlando 10 Fest race is the first in a three-part regional series of races across the country. The festivities will begin at 1 p.m., with the first races kicking off at 1:20 PM. To find out more about the race and to register, click here! HKRS will also hold celebrations in Philadelphia, PA, on Sunday, May 19 at Rose Tree Park; and in Chicago, IL, on Sunday, October 13 at the Kane County Cougars Stadium in Geneva, IL. Find out more about all three events on our 10 Fest Page. We cannot wait to see you out on the fields this spring, at our regional events and at your local Series! Get Up and Go with Us! !